The north is a bustling food hub. (SPOT.ph) Food parks have been a common sight all over Metro Manila as of late 2015, and Quezon City seems to have lots of them. It's a wonderful concept that solves every big group's dilemma of finding a place to eat, simply because there's always something for everyone. In case you need a bit of help deciding, we round up the food parks you can check out when you're up north, as well as the stalls you need to visit in each one. Happy eating! The Yard is the brainchild of Anne Barbara Soriano, Hazel Soriano-Farinas, Brian Farinas, Cohleen Papo-Soriano, and Julius Papo. They claim to be the first ever multi-level food park in Manila, featuring dishes from all over the world that include Asian, European, and American fare. With 30 carefully picked and experienced tenants, it’s a haven for adventurous and curious diners. Come nightfall, the park is lively and buzzing with DJs, bands, and artists. The Yard is at 83 Xavierville Avenue, Loyola Heights, Quezon City. Read more about The Yard. 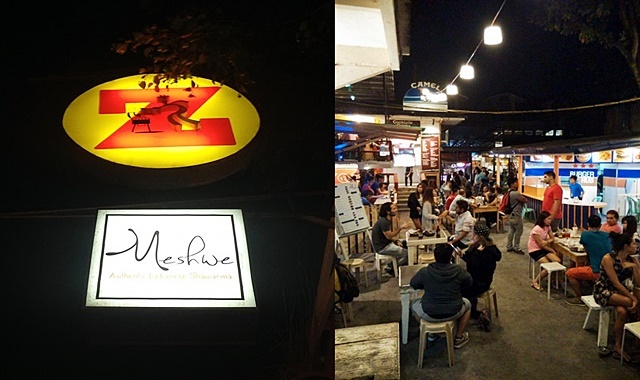 StrEat Maginhawa has been around since January 2015, but the long line of parked cars and the stream of customers every night has not ceased to die down. 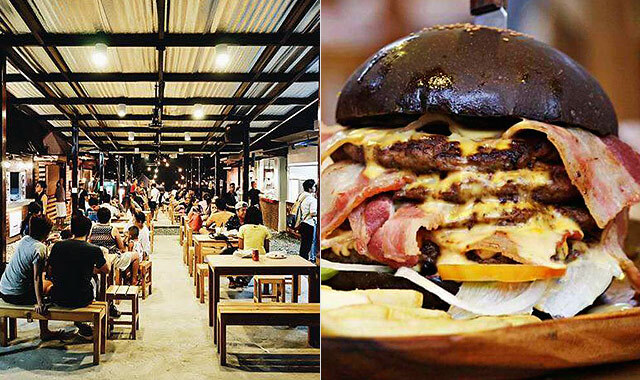 The crazy milkshakes are definitely a reason to visit, but there are other notable stalls that serve burgers, pastas, pizzas, and desserts that are worth checking out as well. 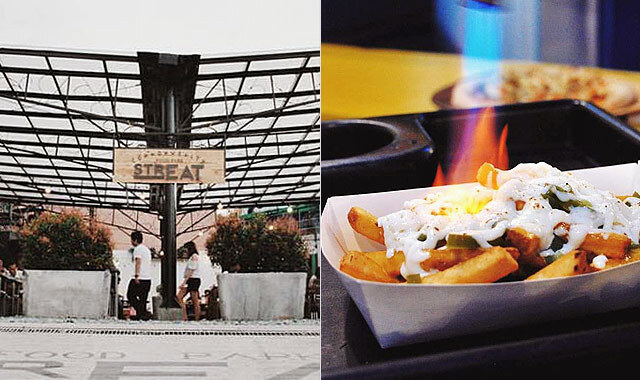 StrEAT Maginhawa Food Park is at Maginhawa Street, Teachers Village, Quezon City. 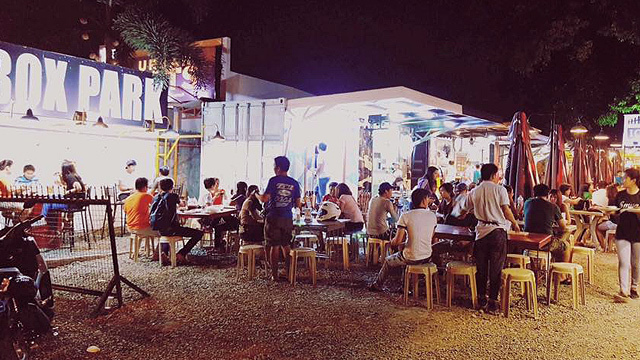 Read more about StrEat Maginhawa Food Park. It may be its first venture out of Maginhawa, but the food finds at StrEat Commonwealth are entirely different compared to its flagship store. Thai, Japanese, Korean, Italian, and Mexican cuisine make up the food finds in StrEat's Commonwealth sibling. Here you can indulge in gourmet hotdogs, rainbow cheesecakes, torched cheese fries, and raspberry bowls to name a few! StrEat Commonwealth is at Don Mariano Marcos Avenue, Novaliches, Quezon City. Read more about StrEat Commonwealth. Open daily from 3 p.m. to 12 a.m. Affordable juicy ribs? Oven baked pork cracklings? Noritakos? To-die-for churros? We could go on and on about how mouthwatering the choices at Boxpark are. If you need more reasons to visit, maybe the waffle and ice cream cups from Mr. Diggins will do the trick. The wide parking space is also a major plus for big groups coming together to enjoy what Boxpark's purveyors have to offer. Box Park is at 73 Congressional Avenue Extension, Barangay Pasong Tamo, Tandang Sora, Quezon City. 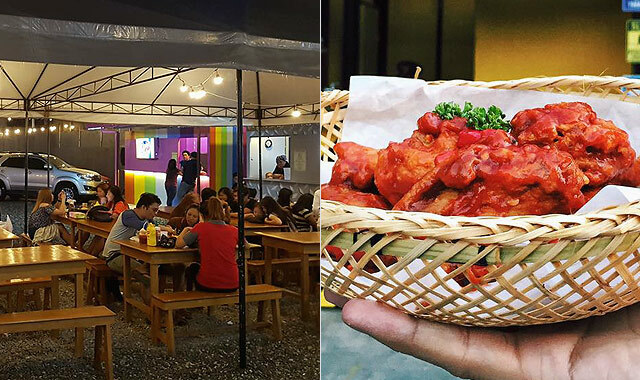 Drive up north of Metro Manila to Fairview’s newest food hub and satisfy your yearning for chicken wings, waffles, grilled flatbreads, s’mores, beef bulgogi, and lots more. Pazar Food Park gets packed around dinnertime, but since they’re still in their starting stages, the place is still relatively quiet throughout the day. 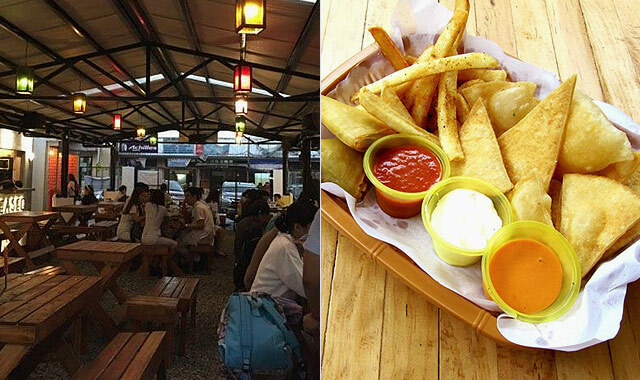 Pazar Food Park is at Block 43, Lot 14, Regalado Highway, North Fairview, Quezon City. “Eat. Chill. Enjoy.” is the tagline of this bustling food hub. 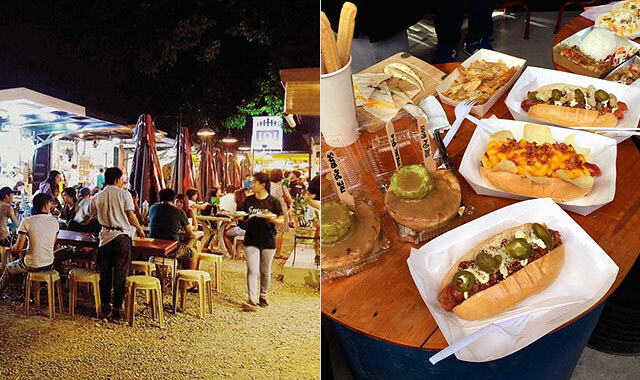 Its strategic location along a busy highway and the eye-popping graffiti all over the walls complete Backyard Food Park's lively street vibe. It’s a bit cramped, but it is easily forgivable once you see all the gastronomic options you have. Some dishes include massive burgers, extremely cheesy nachos, and some unconventional yet delicious skewers. 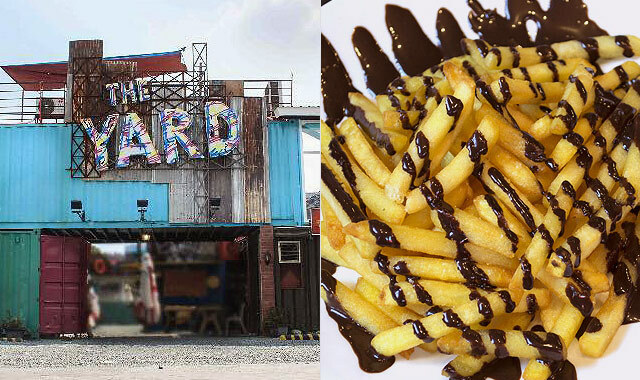 Backyard Food Park is at Lot 11, Block 7, Regalado Avenue corner Coronet Street, Fairview, Quezon City. Care for an adrenaline rush? At Adventure Food Park, food isn’t the only attraction; there’s also a fun wall-climbing activity you and your friends can try. Apart from that, don't forget to enjoy their gelatos and Pokemon burgers,too. 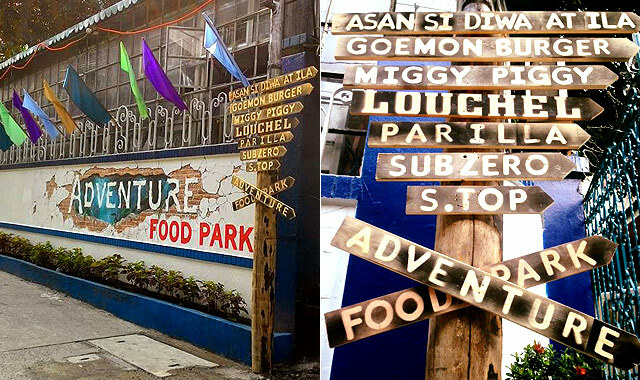 Adventure Food Park is at 704 Aurora Boulevard, Quezon City. 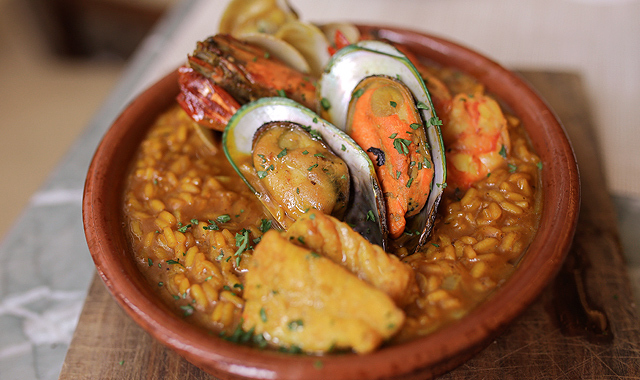 Take your street food date up a notch at Merkanto. Don't be fooled by the car wash up front—step inside and you'll find budget-friendly fare from all over the world including an assortment of Indonesian, Vietnamese, Brazilian, Moroccan, and other street fare that includes satay skewers, roti paratha, nasi goreng, and more. 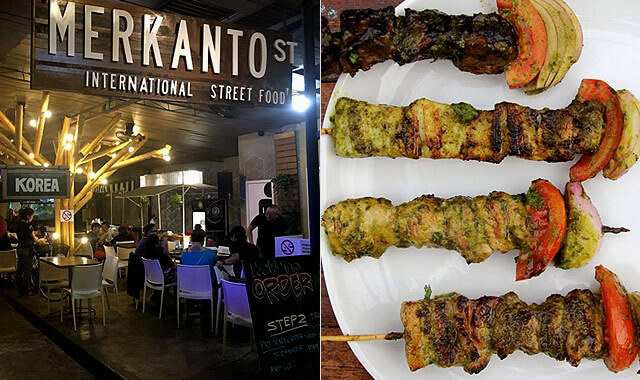 Merkanto: International Street Food Hall is at 38 Mayaman Street, UP Village, Quezon City. Way up north of Quezon City is Novaliches, and there you can find Kings Ground Food Park, an open lot that houses 10 food stalls. No-fuss and straightforward, it’s a great choice for days when you don’t want to be overwhelmed with choices, but still want enough room to sample exceptional food. You’ll even find a quirky katsu sushi burrito here! 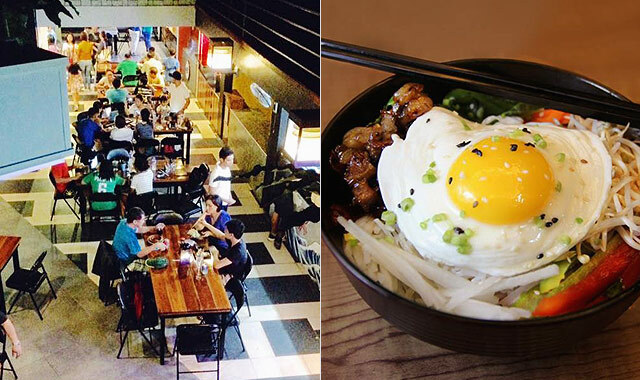 Must-try stalls: Katsu Moto, Gavin’s, Juice Up! Kings Ground Food Park is at 20 King Alexander Street, Kingspoint Subdivision, Novaliches, Quezon City. Open daily from 8 p.m. to 2 a.m. 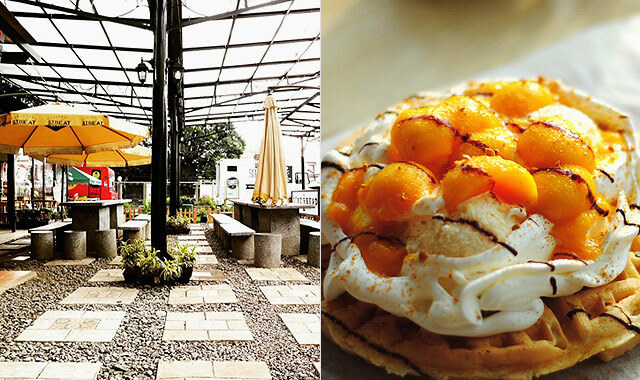 Happy Tables is a cozy and discreet family-style resto hub along Congressional Avenue Extension. What’s great about it is the many unique gems that its food stalls carry. 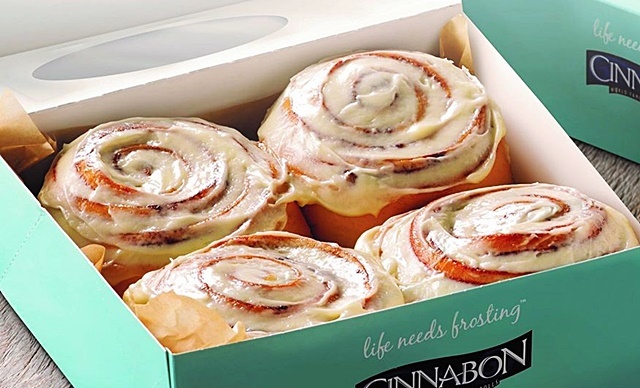 From barbecue chicken tortilla pizzas to Hong Kong street food and matcha chocolate ice cream cups, there’s something for every adventurous foodie right here. Happy Tables is at Congressional Avenue Extension, Quezon City. What's a food park list without the one that started the trend? Z Compound has been a popular hunt in Maginhawa since 2014. The crowd at this food hub is very diverse, from students of nearby universities, curious guests intrigued by all the reviews, and to homeowners who live within the area. The many stalls offer something for everyone, whether you're there for dinner or a round of drinks. Z Compound is at 33A Malingap Street, Teachers Village, Quezon City. Read more about Z Compound.